Estate stamped verso: 'William F. Simpson / Alameda, California'. 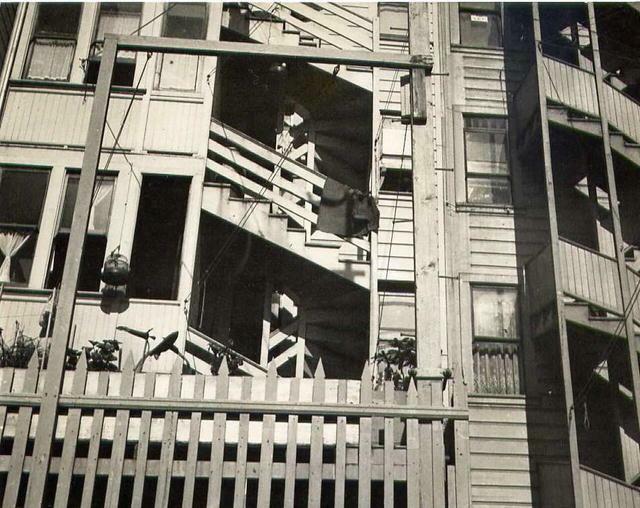 William Simpson was an artist for the Oakland Tribune in the 1930s, and an accomplished amateur photographer. So much so that in the early 30s Willard Van Dyke recommended him for membership in Group f.64. He contributed photographs to Camera Craft magazine, and a large group of his photographs are in the collection of the Oakland Museum. In 'Capturing Light: Masterpieces of California Photography, 1850 to the Present' Sally Stein analyzes one of Simpson's photographs for its striking composition and structure, which 'defied (the) prevailing conventions' of the period (p.133-4). Such strong composition is clearly evident in this photograph. Items Similar To "William F. Simpson: Oakland Tenements"